Welcome to everyone who is interested in this product. When we first started this in July, I had hoped to have a beta released by October. Our dates have obviously slipped a bit. We are still going to deliver this product. It will be GREAT! Pictured here is DPC today. The main screen you see shows a contact list and contact view. In the background you can see “Pinned” windows for Month View, Day View, Tasks and Contacts. The pinned windows can stay on your desktop. This has become the main feature of DPC. The reason is that they are so darn handy. You can size them small but when you need to add a new record, or look up a contact, just one click and you are “live”. Click on a contact list, type a name “bob” and all records matching that name are shown. Hit down arrow and hit enter, and you see all the details. Hit enter again to edit the record. All popups show in under one second, and you can fully navigate without a mouse. Using your mouse you can click on the calendar, move the month forward to see next months schedule, click for a day view and schedule an appointment. All popups under one second. Schedule and save is under one second. Our toolkit is built on Microsoft’s Fluent Design framework. In addition to being very fast, it allows some very nice transparent effects. 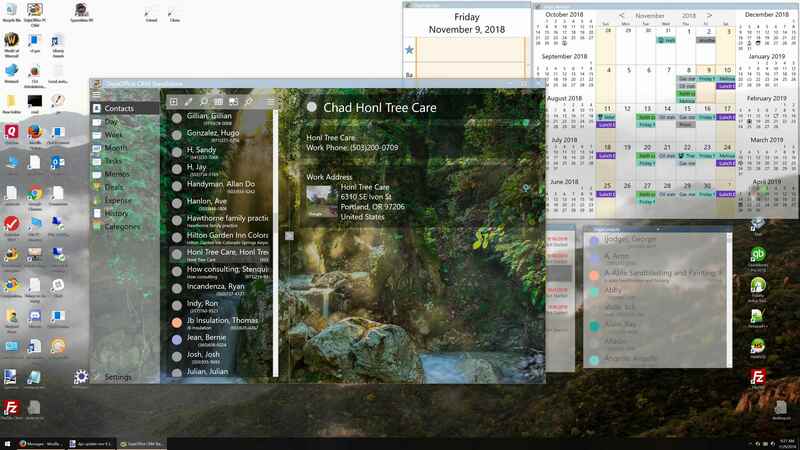 We use the transparency and some nice pictures to make a pleasant workspace This is an app that really shows how Windows 10 is supposed to make life better. DejaOffice PC runs on Windows 7 and Windows 8 also. However, the transparent effects are not available on those platforms. We can’t support Windows XP. Q. If I switch from Palm Desktop and don’t like it, can I go back? – We call this a migration, and the migration App is INCLUDED in DPC, not superseded by it. So setting up DPC will connect Palm Desktop/Outlook/IBM Notes to the DejaOffice App, and keep it fully up to date. This is real-time sync. Q. How does this work with DejaOffice on my Phone. – In addition to migration, DPC has built in sync to DejaOffice on Android and iPhone. You can use Wi-Fi, USB or DejaCloud sync. Q. Does this replace CompanionLink for me? – If you use CompanionLink for Outlook, Palm Desktop or Google then DPC effectively replaces the product. That is; you will not need to use CompanionLink any more. You can always go back though. This product does not remove CompanionLink settings or modify them in any way (except to turn them off). Q. Will there be an Outlook Add-In? – DPC Standalone will sync with Outlook. In addition, DPC for Outlook will have an add-in for Outlook that allows you to launch, view, and modify DPC from inside of Outlook. Using the Add-in is optional, but it will extend the features of Outlook. For instance, in Outlook 2019, with IMAP folders, Color categories are not available. DPC will allow you to set categories for calendar events, tasks and contacts. Outlook will show the colors. – DPC from the start will be able to show data from Act! and GoldMine. But we anticipate adding more specific features in those products in 1qtr 2019. Right now, development is centered on the myriad of small features we built into DejaOffice for Android. Address lookup, selecting multiple categories for a record, We are allocating about three more work days for our current sprint. Our in-house alpha test will start Mid-November. If this goes well, the DejaOffice PC CRM should be in open beta by December 1st. Development on the Outlook Plugin will start then, and we are hoping to release that to beta by the end of December. So we are looking at a January 2019 release date for the full product. Right now, December 1 for release to beta testers. Thank you for your interest.